"Knowing why things happen is half the solution in finding the path to knowledge. 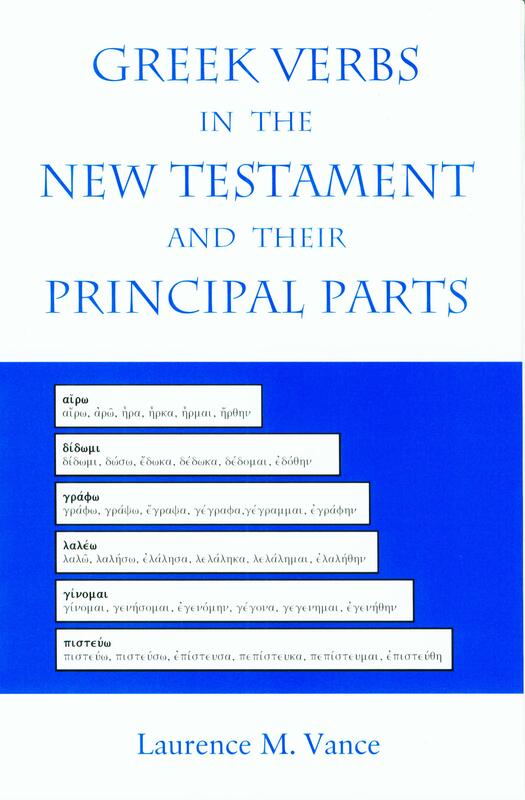 In this book, Laurence Vance takes the wraps off much of the mystery surrounding the many forms that Greek verbs undergo while donating meaning to a literary text. Any language exhibits amazing fidelity to certain rules. Vance identifies many of these to put an end to agonizing frustration in connection with clarification of verb forms, especially those of the so-called irregular kind. Frequently lexicons seem to close their doors to searchers of a main verb entry. With the help of Vance's book, sentences will begin to make more sense and lexicons will open their doors to the once-hapless searcher." ~ FREDERICK WILLIAM DANKER, Ph.D.
Reviser and editor of A Greek-English Lexicon of the New Testament and Other Early Christian Literature (3rd ed., The University of Chicago Press, 2000), and Christ Seminary-Seminex Professor Emeritus of New Testament at the Lutheran School of Theology in Chicago.